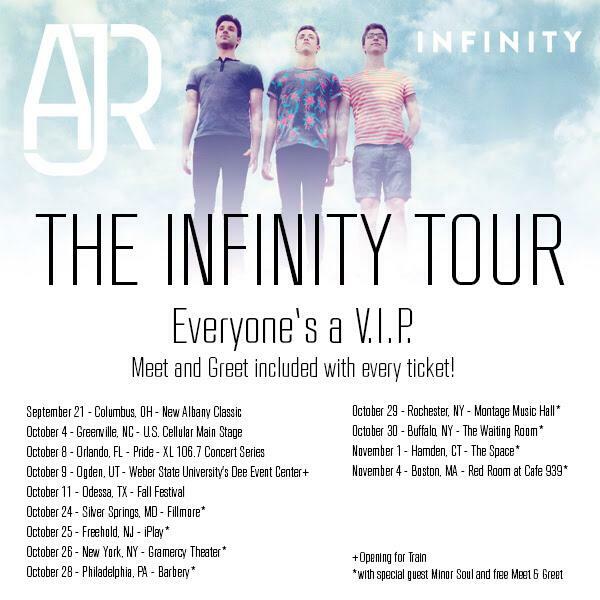 AJR just announced dates for their Fall headlining tour. The Infinity Tour, with special guests Minor Soul, is in support of the soon to be released “Infinity” EP, out September 23rd. Tickets go on sale this Friday, September 12th, and every ticket gets a meet & greet with the brothers! Check out the dates & details below. Make sure you pre-order your copy of the “Infinity” EP on iTunes or Amazon now! Adam, Jack and Ryan always put on a great show, and we can’t wait to see what they have in store for The Infinity Tour. Their energetic sets are a mix of old and new material, covers, and some unexpected moments, that will have you dancing until you’re dumb in the dark. Follow AJR & Secret Fangirls for more updates!